Project 116 is now moving into the final stages of build and fit out at Danish Yachts’ shipyard in Skagen, prior to sea trials scheduled for early this Summer. Designed to a length of 38 metres, this jet driven Espen Oeino design will have a cruising speed of around 50 knots and a range of up to 900 miles. 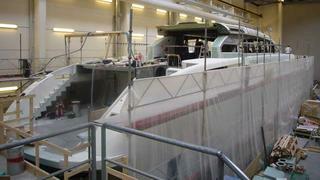 The carbon composite hull and superstructure are now complete with the smaller fit outs now taking place. The two main engines are fitted to their mountings along with the drive lines, which will await final line up after the motor yacht has been launched. The infra red controlled passarelle is already complete and telescopically stowed in the starboard side of the vessel. All the electronics’ cabling is in place for the main bridge console and the final panel layouts are now approved, awaiting final fitting. Attention to detail is key in the Danish Yachts’ shipyard and all the different manufacturers' boards were sent to Radio Zeeland in Holland to incorporate all the switches into one integrated panel, to make all the controls and switches appear the same.